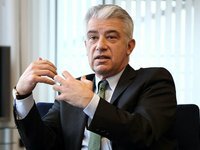 German Ambassador to Ukraine Ernst Reichel has said he hopes that the recognition of the independence of the Ukrainian Orthodox Church will be an important step and will contribute to strengthening the unity of the Ukrainian people. "Ukraine is a country of many religions and confessions. Nevertheless, the 1030th anniversary of the Rus conversion to Christianity was an important event. The expected recognition of the autocephaly of the Ukrainian Orthodox Church will be a very important step. This remains a personal decision of every believer as to how he or she will treat this. But I hope that this event will contribute to strengthening the unity of the Ukrainian people," the ambassador wrote on his Facebook page on Monday. As reported, on April 17, Poroshenko talked about his intention to appeal to Archbishop of Constantinople, Ecumenical Patriarch Bartholomew, asking him to issue a Tomos (an official church document) granting autocephaly to the Orthodox Church in Ukraine, and called on the Verkhovna Rada to support it. On April 19, 268 MPs supported the appeal of the president of Ukraine to Ecumenical Patriarch Bartholomew to grant a Tomos about the autocephaly of the Orthodox Church in Ukraine. The Holy Synod of the Ecumenical Patriarchate in Constantinople accepted the president's appeal for granting a Tomos about the autocephaly of the Orthodox Church in Ukraine and decided to begin the procedure needed to grant autocephaly to the Ukrainian Orthodox Church.